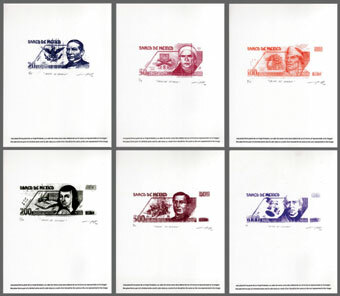 Series of six silkscreen prints of the common circulation bills in Mexico at 2006. Each print forms are part of a limited series and its sale value, as a work of art, should be the same as the represented of the image. The print of the highest value has less series and vice versa. We are pleased to be able to present the first solo exhibition in Berlin by the Mexican artist Isaac Torres. It is precisely in times of economic crisis that we are confronted with numerous questions concerning the determining of value, diminishing value, market mechanisms and their influence on the appreciation and depreciation of money. Already since 2004, Isaac Torres has made numerous works dealing with the themes of money, valuation, the by-products of work and the survival strategies involved in making money in an urban context such as Mexico City, his native city, or Berlin. His works address classical questions of political economy: What is the value of money? How is value defined in monetary terms? What is the relation between money and work? 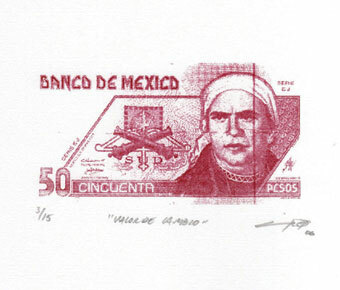 In the work Exchange Value (2006), he reproduces bank notes, declares them artworks, and prices these according to the value represented on each note. Torres researches and documents how, in different ways, new parallel markets come into existence - in legal as well as illegal settings. Among other things, he collects public transport tickets whose stamps have been manipulated in such a way that the tickets can be resold on the black market and thereby regain their lost value. In the installation for his exhibition in Berlin, Torres adapts the idea of organised carpooling that he learned about during his stay in Germany in 2009. He transfers this widespread and cheap travel alternative to a route stretching from the southern to the northern border of Mexico - the journey commonly made by South American immigrants heading for the USA. While, in Germany, the driver, by optimising organisation and efficiency, is occasionally able to make a small profit, Torres' transfer gives this playful thought experiment a new political topicality that goes beyond its simple economic implications. In his frequently serialised works, Torres either meticulously conforms to the laws of the market to find ways of leading these ad absurdum, or suggests alternative possibilities operating outside of predetermined structures that arise as soon as there is a scarcity of money.